The capstone project for BSN program puts emphasis on the application of state-of-the-art technologies relevant to health care. The BSN capstone project ideas provide students with the opportunity to integrate what they have learned in order to produce a comprehensive project. While students are in the process of updating their electronic portfolios they must likewise be in the process of doing a topic research that they are interested in. The project must be done with the students’ interest in mind. 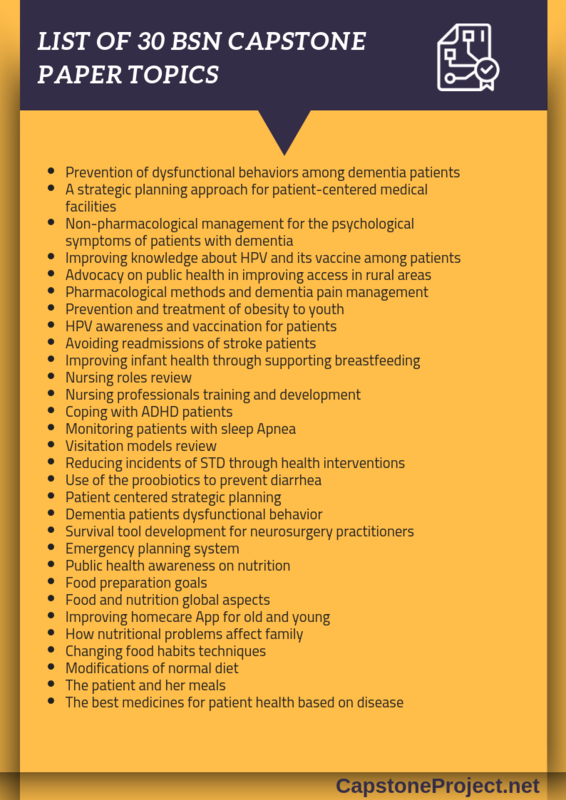 The capstone project is an opportunity for students to have hands-on application regarding a health issue or project, and the findings must have practical relevance to the project at hand. Complete the capstone design project application proposal. Answer questions and discuss project essential topics with the capstone committee during the application process. Must contemplate on the required time and resources needed for the project planning process. Must communicate actively with faculty adviser during the entire length of the project. Must make steady and solid development on the capstone project. What Should Be Included in BSN Nursing Capstone Project Ideas? The starting point of any project is going to coming up with the right BSN capstone project ideas. Time spent getting your topic selection spot on will always be time well spent. Problems faced here will only multiply as you work your way through your project. This is why you must put in the work up front to select a project topic that you know will run smoothly and get you the results that you are looking for. Is it going to be interesting for you? Trying to spend time doing research and writing that you find a chore is going to be even harder. Always select something that you have a true interest in. Will it allow you to demonstrate what you have learned? The whole point of your capstone is to show what you have learned. Your project must therefore be relevant to your course. Is it unique? Your project should be new, after all there is no challenge in doing something that has already been done by another. Is it feasible? Your project has a limited amount of time and you only have the tools and other resources that you have to hand. Your project must therefore be something that you will be able to achieve with what you have. Each student will be assigned a specific faculty member who will monitor and evaluate his or her experience during the entire length of the course. Final evaluation of the capstone project will be done by at least two faculty members while the Capstone Committee will be represented by non-faculty members. 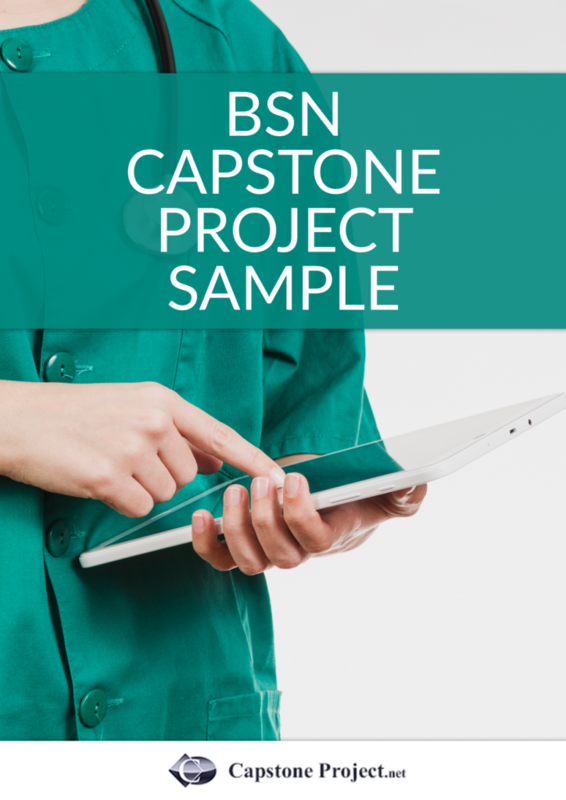 Students are advised to update their work on the BSN capstone project ideas on a regular basis because it is an essential part of the capstone project for BSN program presentation. The challenges involved in the BSN degree is minimized by the integration of modern technology brought about by Capstone projects; hence students can sustain technical drawbacks efficiently. We are also ready to assist you with any interior design capstone project. 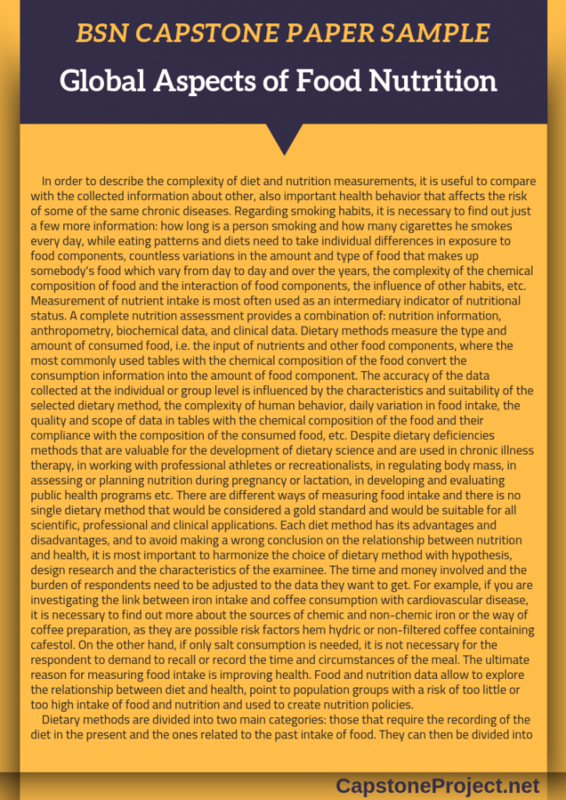 If you have looked at our BSN capstone project examples you will see that the standard of writing that is expected of you is very high indeed. Your writing must be perfectly formatted and free from any issues if your work is to be accepted. While selecting the right BSN capstone project ideas for your research will get you off to a good start you must still ensure that you put in a huge amount of hard work with your writing. Understand the requirements: your program will provide you with a huge amount of information as to how your paper should be completed. You must ensure that you fully understand exactly what they are looking for from word counts and formats to the structure of your paper. Instructions must be followed to the letter. Create a plan for your writing: all aspects of your capstone project should be planned out with milestones for the completion of each section. Allow time for issues and rewriting within your plan and ensure that you stick to what you have laid out and take action as required. Make a daily target: try to do a set number of words for your writing each day. Don’t however set yourself a target that you have no hope of reaching as this will just de-motivate you. Have a routine: by writing at the same time each and every day you can get yourself into a clear routine that will help you to meet your daily targets and move things steadily forward. Outline the BSN capstone paper: this does not have to be overly complicated but the time spent on an outline will always be well spent. It will help to guide your writing and avoid many issues that could arise. Proofread: mistakes can cause your paper to be rejected, always ensure that you take the time to carefully review your writing and correct any issues. 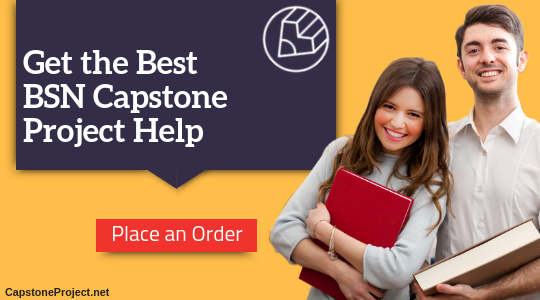 If you are struggling with writing a good BSN capstone project then we are here to help you. Contact us today and get a high-quality assistance with your project writing. Select the right BSN capstone project ideas and write an impressive paper with the help and support of our highly qualified and experienced consultants!